Have you thought about all of the court markings for racquetball – their appearance, locations, and purpose? Official court markings (lines) are required on every court, and we’ve touched on each of them in previous articles; but let’s address them all at once now for perspective. The diagram below is taken from the official Racquetball Court Specifications, revised April 11, 2007. All required court markings are shown below in red, with other allowed colors being white or black, and must be 1-1/2 inches wide. Occasionally, you might find courts with a horizontal line high up on the rear wall to denote an out of bounds area, but that is not a required marking. All rule references come from the USAR Official Rules of Racquetball which also includes this court diagram for reference. This line bisects the court into two 20’ areas. It defines the backmost point of the Service Zone within which the serve must be hit. Its back edge is placed 20’ from the front and back walls – rule 2.1(b)1. It combines with the Service Line to create the 5’x20’ Service Zone – rule 2.1(b)3. The Service Zone is the area from which the server must start the serve motion and hit the serve, including certain limitations created by the Drive Serve Line described later in this article. The Short Line defines the minimum length of a legal serve – “Any served ball that first hits the front wall and, on the rebound, hits the floor on or in front of the short line either with or without touching a side wall is a short serve,” which is a fault serve – rule 3.9(b). This line defines the frontmost point of the Service Zone within which the serve must be hit. 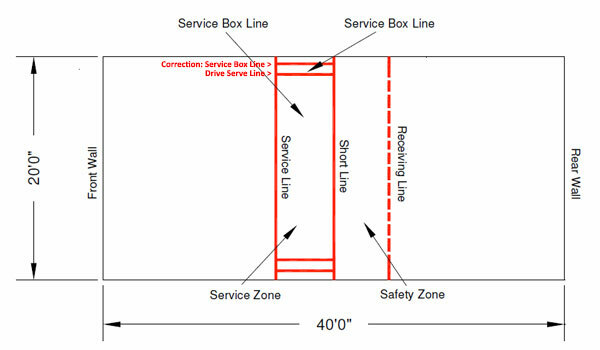 Its front edge is placed 5’ from the rear edge of the Short Line, creating the Service Zone between those two lines – rule 2.1(b)2 (see the “Short Line” section above for more information on the Service Zone). To start the serve, the ball must be bounced within the Service Zone – rule 3.3. At the start of or during the service motion, any part of the server (or doubles partner), including the racquet, cannot touch the floor outside of the Service Zone – rule 3.9(a)1. At the end of the service motion, any part of either of the server’s feet can land on the Service Line, but cannot go completely beyond it – rule 3.9(a)2. Either of the previous two cases creates a foot fault. See rules 3.2 and 3.3 for a complete description of the start and manner of serve. The Service Box lines define an area at each end of the Service Zone and are used only in doubles play. The edge of the line nearest to the center of the court shall be 18 inches from each side wall and within the Service Zone – rule 2.1(b)4. The non-serving doubles partner must stand in a service box, subject to certain criteria – rule 4.2(b). The Drive Serve lines define two Drive Serve Zones. The lines are parallel with the side wall and are within the service zone. For each line, the edge of the line nearest to the center of the court shall be 3 feet from the nearest side wall – rule 2.1(b)5. The Drive Serve Zone is enforced only during a drive serve and depends on where the server begins and ends the serve motion and where the served ball travels. Violating the Drive Serve Zone results in a fault serve – rules 3.6 and 3.9(h). This is a broken or dashed line parallel to the short line that touches each side wall. There are specifications as to the length of the dashes, but that is not always followed – rule 2.1(b)6. The back edge of the Receiving Line is five feet from the back edge of the Short Line and creates the 5’x20’ Safety Zone – rule 2.1(b)7. The Safety Zone applies to the receiver and server. Violating the Safety Zone by the receiver is a point for the server – rule 3.11(a)1. Violating the Safety Zone by the server is an out serve – rule 3.10(i). The Safety Zone is primarily for the safety of the players during the serve and receive phases. 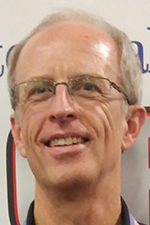 All of the markings on a racquetball court pertain to various aspects of the serve, and only to the serve, highlighting the importance of the serve in the game. Being able to identify, name, and know the purpose of each line ensures a consistent understanding among players, and a safe and fair game.